These are Crispy Curry Fries, made with shredded russet potato and seasoned with onion, garlic, curry leaf, curry and chili powder. It's a simple snack, but the taste really good. Shred the potato with a mandoline. Rinse and soak the shredded potatoes in cold water for about 10 to 15 minutes. Then drain and squeeze dry with paper towel. Mix grated garlic, red onion, curry powder, chill powder, sea salt, and black pepper, until you have a paste. Heat about 2 inches of cooking oil in a wok or pan over moderate to high heat. When the oil is hot, fry the potatoes in few batches. 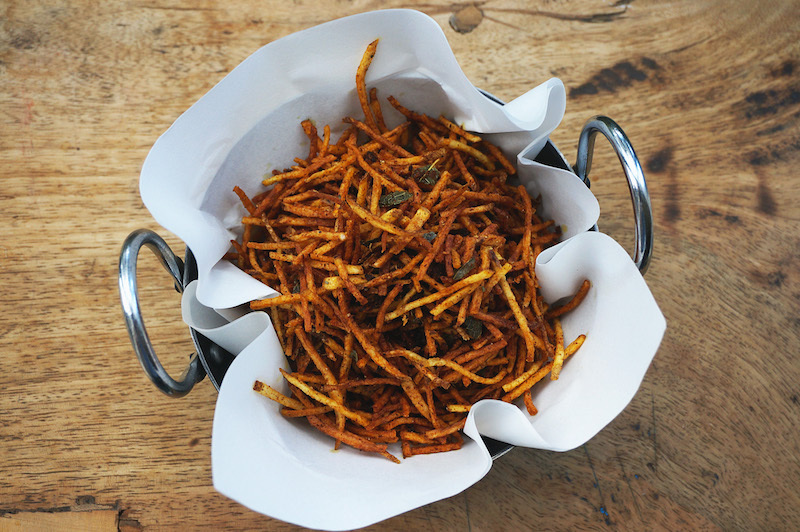 Once the potatoes are crispy, remove with a wire strainer, and drain on paper towel. Heat 2 Tbsp of peanut oil in a pan or wok over moderate heat. Fry the spice paste until fragrant, brown, and slightly dry. Then add the crispy fries, mix and toss well. Let cool completely before serving. Great job! Thanks for sharing in a detail manner.